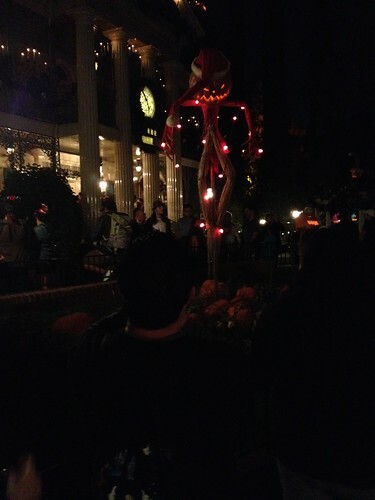 Technically, my trip to Disneyland was just outside the Halloween season. I was looking for souvenirs; lights, lawn decor, etc; to give to Carole and Larry for Christmas, but Liz said it's all gone overnight between October 31st and November 1st. You really have to come during October to see any of that. I admit to being skeptical. I can find Halloween decorating items now, if I look for them. Why shouldn't Disney be any different? I should not be skeptical of what Liz says. There were no items around. Even in the area around the Haunted Mansion, there was nothing. It was all Christmas-themed by the time we got there, one week later. 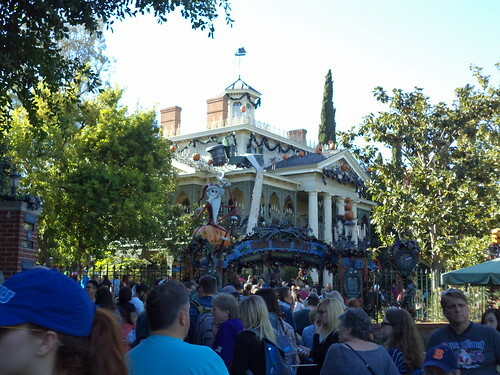 The Haunted Mansion, on the other hand, was still wearing Halloween finery. It was kind of a mishmash of seasons. There's the distinctly Halloween of pumpkins, but there's also garlands representative of Christmas. 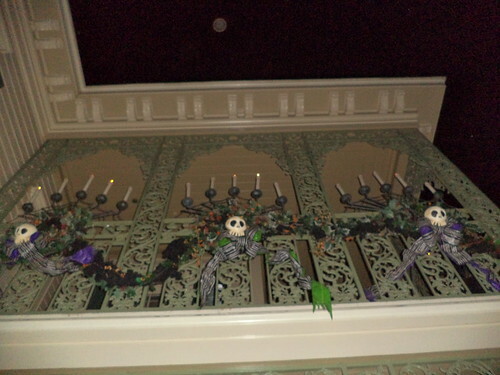 As you got closer, you realized this was a "Nightmare Before Christmas" decorating style. 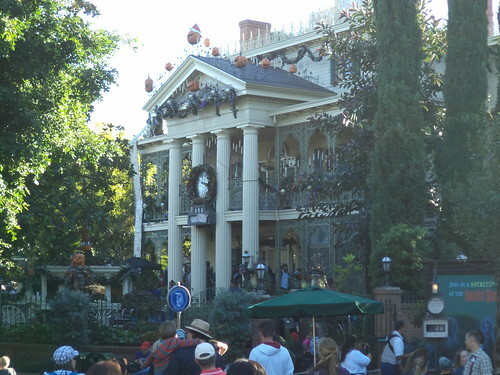 Liz said the mansion, with its hugely popular ride, goes "Nightmare" in October and stays that way through Christmas. Jack Skellington is everywhere. At night, I wanted to get the full effect of the lighting, but this is the best exterior photo of him I could get. And, the decorations didn't turn out very clear after the sun went down. This wreathing and garland arrangement on the side of the front porch came out well, but other photos didn't. You need to be able to stand still for night shots, and, let's face it, Disney is about shuttling as many people as possible through their rides. You might stand still but your party will head off without you. Long exposure photos, even if they depict something wonderful done with lights, just aren't what standing in line is supposed to do. Now I wonder what the building looks like without all the decorations. /sigh They keep you wanting to come back, don't they?